If you were watching the Barrett-Jackson auction last night you might have caught the unveiling of the this year's Indianapolis 500 pace car, a 2011 Chevrolet Camaro SS Convertible. 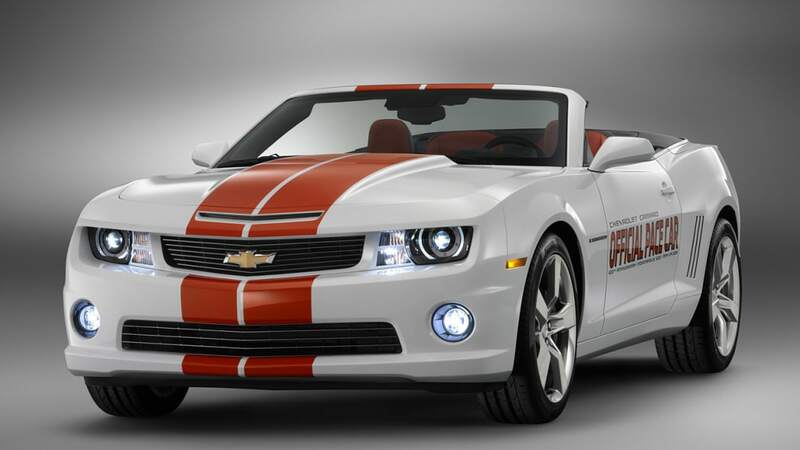 Styled after the iconic Camaro pace car in 1969, the modern version features Summit White paint with orange stripes and an orange leather interior. This will be the seventh time a Camaro has paced the legendary race, which is celebrating its 100th anniversary. So why unveil the car at Barrett-Jackson? You guessed it. Chevrolet will be auctioning off the first of fifty replica pace cars on Saturday evening. The full proceeds from the auction will be donated to the David Foster Foundation, a charity that supports families with children that need organ transplants. Hit the jump for full details in the press release from Chevrolet. Thanks to everyone for the tips! 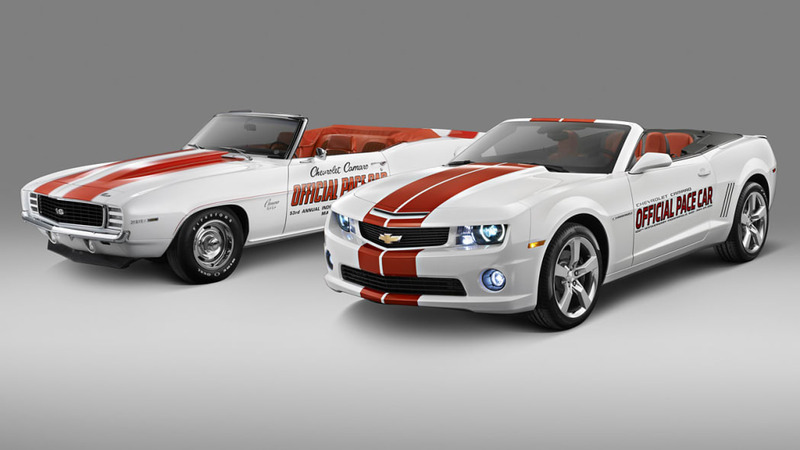 DETROIT – A special-edition Chevrolet Camaro Convertible will serve as the official pace car of the 2011 Indianapolis 500. Chevrolet and Indianapolis Motor Speedway officials made the announcement at the Barrett-Jackson Scottsdale classic auto auction, where a bidder will have the opportunity to purchase the first of 50 Indianapolis 500 Festival Committee cars. The 2011 Camaro Convertible is the 22nd Chevrolet chosen to pace "The Greatest Spectacle In Racing®" and the seventh Camaro. Adding to the rich heritage is the fact that 2011 will mark the 100th anniversary of the first Indianapolis 500, as well as the centennial year of Chevrolet. Chevrolet will donate full proceeds of the auction to the David Foster Foundation, a charity devoted to supporting families with children in need of life-saving organ transplants. David Foster, the 15-time Grammy-winning music producer and songwriter, founded the organization in his native Canada. The pace car, along with the matching festival cars, features a Summit White exterior accented with orange stripes and door graphics. The interior is trimmed in orange leather, including front seat headrests embossed with the Indy 500 logo, along with white door panels and instrument panel trim. The instrument panel trim features extensions of the orange exterior stripes. The color combination is similar to the design used on the 1969 Camaro Indy pace car – replicas of which have become among the most popular Camaros in the collector world. "The Indianapolis Motor Speedway and the Chevrolet name have long been associated with one another beginning with Arthur, Louis and Gaston Chevrolet's participation as competitors in the Indianapolis 500," said Indianapolis Motor Speedway President and CEO Jeff Belskus. "It is fitting in this 100th year for both brands that we reinforce that relationship through this year's Camaro pace car, which resembles what many argue is the most famous pace car in IMS history, the 1969 Camaro. We are looking forward to seeing this car on track, pacing the greatest 33 drivers in the world on May 29." Equipped with a 400-horsepower (298 kW) V-8 engine and six-speed automatic transmission, the actual pace car for the race requires no performance modifications to perform its duty in front of the racing field. * Center console with auxiliary gauge package. Along with the 2SS equipment, the cars feature the RS package, which includes HID headlamps and unique tail lamps. The Camaro Convertible delivers coupe-like driving dynamics, with the unmatched fun of open air driving. The Convertible model contains an enhanced structure designed to eliminate the traditional compromises of open cars, such as cowl or steering wheel shake. The goal is a convertible that drives like the coupe. All the powertrain and suspension elements of the existing Camaro Coupe carry over unchanged in the convertible. The top has a smooth, tailored fit, with acoustical foam in the headliner that helps deliver a quiet ride with the top up. * Front and rear underbody "V" braces. The power-folding top retracts in about 20 seconds. It is built in partnership with the same manufacturer as the Corvette convertible top, and operates in a similar manner. That means it folds in a simple "Z" pattern and latches with a single, convenient handle located at the center of the windshield header. Other convertible models in this segment still offer convertible tops with dual latches, forcing drivers into two-hand operations reaching across the car. The regular-production versions of the 2011 Camaro Convertible will begin arriving in Chevrolet dealerships in February, opening a new chapter in the Camaro's ongoing 21st century rebirth. Even before the introduction of a convertible model, Camaro ended 2010 as the sales leader in its class in the United States for the first time since 1985. Louis Chevrolet, who founded the brand with William "Billy" Durant in 1911, was a racer, mechanic and pioneering engineer. He raced in the early years of the Indianapolis 500, which also started in 1911, and served a luminary of the event in the years after he retired his racing helmet. That included driving the official Indianapolis pace car, which was developed by Indy 500 founder Carl Fisher, who believed a rolling start was safer than a standing start. The first Indianapolis 500 featured a pace car driven by Fisher.